My printer's stopped working, or "50 ways to leave your paperrrr..."
At this point, many professionals hardened by a life in the trenches, under constant fire from users, managers & suppliers, have lost the will to live, and have ended their lives using the ancient japanese rite of Hari-Epson-ki (death by a thousand paper cuts). 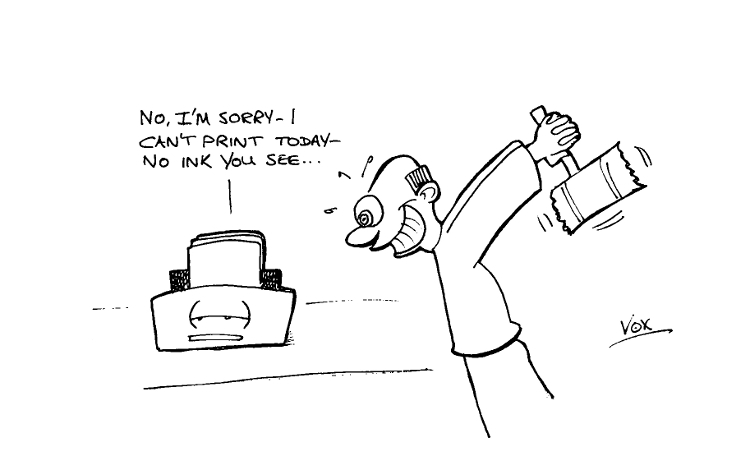 To ease their ancient burden (and to prevent many a premature, and stingy death), we present to you everything you (as a user) need to know about your printer. Laser - these create a image of your printed page on a special drum using static electricity - the drum is then covered in black powder called toner which sticks to the static image. 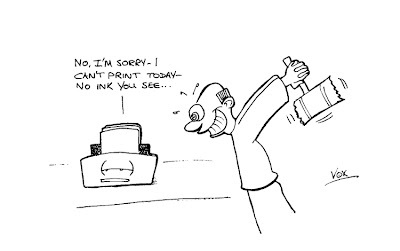 The drum then transfers the toner to a paper page, which is then heated to fuse the toner to the page as ink. Colour Laser - same as a normal laser, but the image is seperated into 4 distinct colours (black, cyan, magenta and yellow), before fusing to the page. Do not use sharp objects to poke anywhere in the paper path - seriously! Marks on toner drums (you can try wiping these off with a lint free cloth. Refilled Inks/Toners - I know inks/toners are expensive, but refills are always problematic - any problems, replace with an new cartridge. Support: No problem. How much memory does it have? 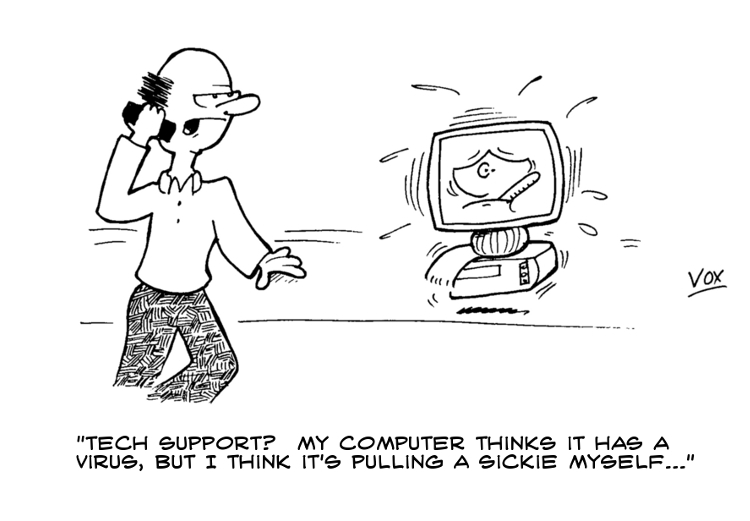 Support: (groans) No, how much physical memory does your machine have? User: I told you, 250 Gigs. Support No problem. How much space do you have free? Support: Ok - delete everything from the temporary area. Support: How much space fo you have free now? Computers need to able to store information, otherwise, they simply couldn't function (and what would be the point in that). 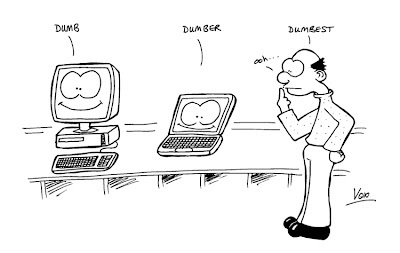 Computers need 2 basic types of storage space; storage that can be accessed almost instantly, and storage where the access time doesn't matter. With me so far? 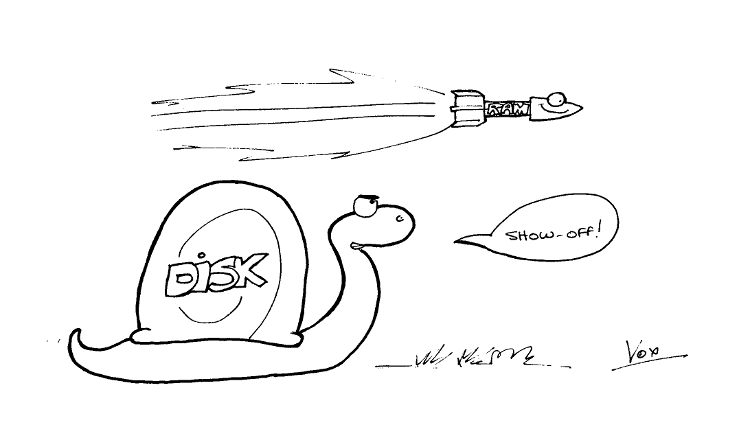 In contrast, Slow Storage is used for data that needs to be non-volatile i.e. available to the system after power is removed. 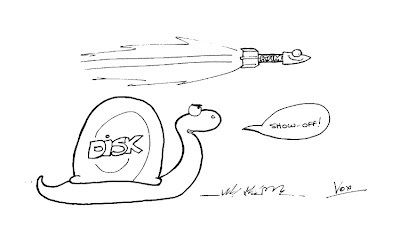 The most common form of Slow Storage is in the form of Hard Disk space, which we use to store the Operating System e.g. Windows 7, the programs we wish to use, and the data for those programs that we want to keep (such as photographs). Hard Disks are basically a collection of metal platters which store data magnetically. Fast Storage is expensive, which is why you have quite a bit less of it than cheap and plentiful Slow Storage. The more Fast Storage you have, the faster your machine will run, but be warned - each machine has a limit on how much Fast Storage it can use. You may have heard of Flash Drives, USB Sticks or Solid State Drives - these are all forms of Slow Storage that are either faster, more portable, or more reliable than normal Hard Disks. CD / DVD's are Slow Storage that are designed to be read only (you can't put data on them) or read many / write once in the case of DVD / CD writers. So why the confusion? Simply because both types of storage are measured using the same scale - the Byte. 1 Byte can store a small amount of information (such as a character). 1 MegaByte = 1 Million Bytes (approximately) and 1 GigaByte = 1000 MegaBytes (also approximately), so as you can see, 250 GigaBytes is a lot of information! ...been very busy at work. Two new posts will be available soon, once I get the cartoons done, so keep checking! "I'll send you the password via email..."
It's 4.55 p.m. on a wet and windy Friday night, somewhere in the great metropolis, and you're coming to the end of a long working week. In just 5 minutes time, you'll be going home, ready to enjoy the promise of a weekend you have been planning for months. The hotel room is booked, the kids have been shipped off to your sister-in-law, and the wife has been out shopping today at that new Ann Summers shop in the high street - life really is good. "I need the password for the Director's pension file..."
Now that I have your attention, as I gently fondle my very own baseball bat, I think the time has come to tell you the truth. There - I've said it. I know you use it every day, and I know you can't live without it, but it is not safe. When you send an email, it travels in a plain text format - that is, it is completely readable by anyone. This is necessary because email has to travel between varying systems, that utilize varying technologies - it simply can't travel any other way, and by default, when we send an email, it travels in plain text. Therefore, sending a password by email is like you throwing your front door key into a crowd whilst shouting "that's for number 29 folks - help yourselves!" 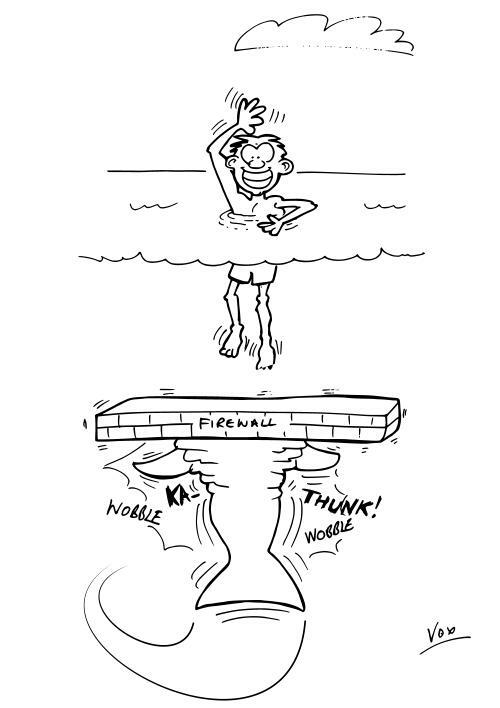 So, how do we send a password (or a document) safely via email, if we have no other choice? Well, we disguise it, by using encryption. Encryption is a method where we turn some piece of data into something unrecognizable, and then change it back again later on. Encryption options depend upon the type of email client you are using, so I can't really give specifics, but google is your friend - just look up email encryption options for your email client, most are based on some sort of PGP Public / Private Key encryption or Digital ID's. Failing that, create a document, place the password in the document, and use an archiving solution like Winzip, WinRAR or 7Zip to generate a password protected archive containing the document, which you can then send in an email. Then just phone up the person and give them the password to the archive. "Downloading music isn't illegal, is it?" Of course, it isn't. Times have changed, but the music business hasn't. The record companies and the artists still want to make money, so they charge for their music - the only fair way to do it. You go and by the CD - that's fine, because you're paying for the privilege of listening. You RIP that CD to your IPod - that's fine (I think), because you've paid for the original. You give the ripped files to someone else - now the problems start, because that's illegal. Downloading music is fine - provided you have either a) paid for it or b) the artist says it's free to download. Everything else is piracy - period. No ifs or buts. Download music illegally and you may as well steal a copy from a store, because that's what you're doing - stealing. "I need Office / Photoshop to..."
We're over 40, and we're skint. So WHY OH WHY do we have to keep hearing this question? "I've got a word document - I need Microsoft Word to open that - how much is it to buy - have you got a copy?" or "I've got a photograph to edit - I need Photoshop to edit it - how much is it, or have you got a copy I can borrow?" Let's get one thing straight from the off. Yes, Microsoft created "Word", and Adobe currently own "Photoshop" and yes, they are good products - but you don't actually need them to open word documents, or photos - they are just the most popular programs used for word processing / graphics, mainly because they are used in business, where money is not really an object. They have become what's known as "the industry standard", which is company speak for "it works for us", and the file formats they use, are also the most commonly used. Open Source is more of a movement, than a phrase. It's a philosophy for software creation. In short, it means that anyone can modify an existing Open Source program, provided the modifications (and the source code that has been changed) is made freely available, for nothing. Open Source is powerful, because it puts the power of software back into the hands of the users. You need something done - someone somewhere has probably already created that will do it for you, for nothing. 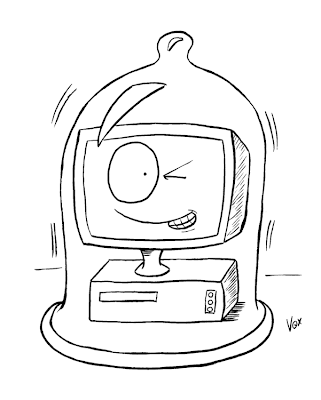 Open Source has even given birth to Operating Systems, such as Linux! Open Source has lot's of success stories, and I'm going to introduce you to two of them. LibreOffice is an Open Source competitor to Microsoft Office. It can create, edit and save office documents in many formats (including Microsoft Office) and even looks and feels the same to use, but it's completely free. My kids have used it for homework, and I've used it for business - why pay for Microsoft Office, when this exists? 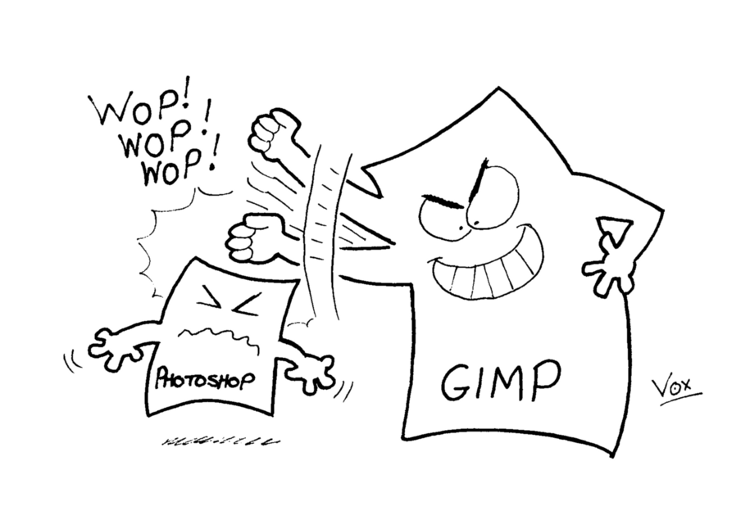 The second success story is GIMP. 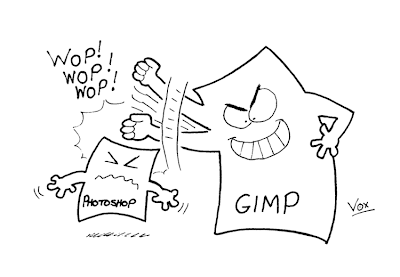 GIMP stands for Gnu Image Manipulation Program, and is the nearest thing available to Photoshop that is free. It can manipulate photos, create stunning artwork, and 9 times out of 10, it can do everything photoshop can, for everyone up to the level of professional artists. 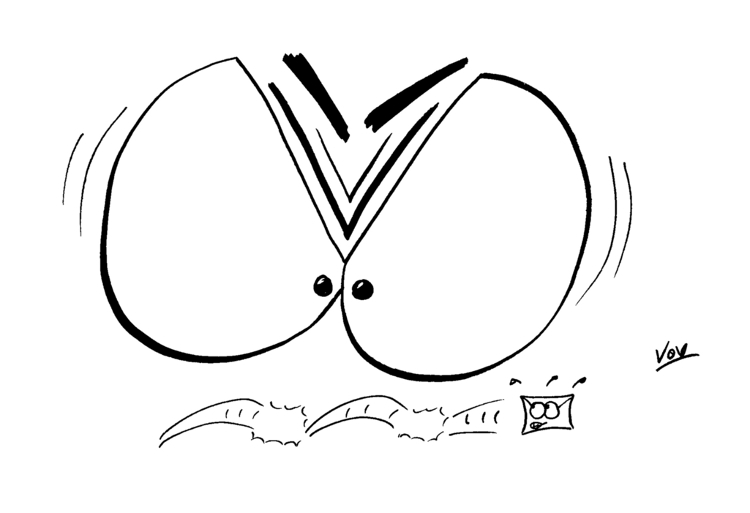 I use it all of the time, in fact, the cartoons featured in this blog were adjusted by GIMP. "I went on this great site last night... and now I've got a virus/trojan!" 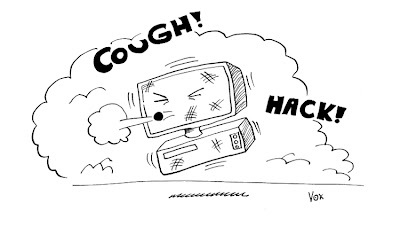 OK - for our third (and final) part of this article, were going to look at what to do if you suspect you have a virus or Trojan. The first question I'm often asked is "what's the difference?". Well, a virus is a program that is intent on replicating itself to other computers without the user's knowledge, in a similar way that a real virus infects your body, and passes itself on to the next person (like the flu). A Trojan (named after the famous wooden horse of Troy) is a virus that wants to do more than just replicate - it wants control of your computer for it's author's use, and by it's definition, a Trojan is more serious. The first thing to do is to ascertain if your computer is infected. The best way to do this is also the best way to fix it, and by that, I mean "scan your computer for viruses". If you haven't already done so, install a anti-virus solution like AVG, and run a full scan for viruses. Once the scan has finished, you'll have the option of either quarantining the viruses found, or removing them from your computer - either is an acceptable solution. Now that you've installed / run your anti-virus solution, make sure you keep it up to date by downloading the latest virus signatures - if you don't do this on a regular basis, all the hard work you just did will be undone very quickly, so check your anti-virus's documentation on how to keep up to date. The next thing is to search your computer for Adware - these are programs that are not technically Trojans, but are the next best things - programs that want you to buy a product, by hijacking your PC and pointing you to the authors website. Because Adware is specialized, you'll need a specialized tool to deal with it - my favourite is SpyBot S&D, because it's thorough, and it works. Install it, update it, and run a full scan, then fix any errors it finds. 9 times out of 10 the above methods should sort you out. If they don't try looking at www.pchell.com - here you'll find lot's of useful information on viruses, Trojans, and other annoying PC specific problems that may be affecting you. The first two are no-brainers. Always try and keep your computer up to date with the latest patches, and do the same with your browser. For Windows, this usually means running Windows Update either automatically, or frequently. I'm not kidding when I say that new flaws in Windows are being found every day - for goodness sake, Microsoft even have an official day of the month - Patch Tuesday - where they release fixes for discovered vulnerabilities. 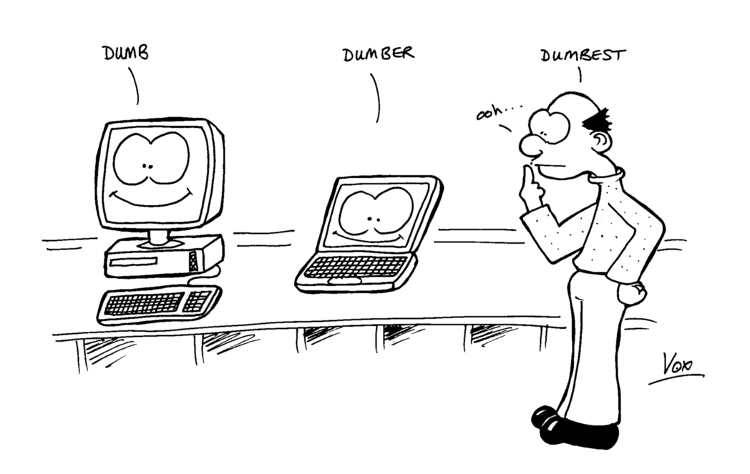 Internet Explorer is not the only browser out there. 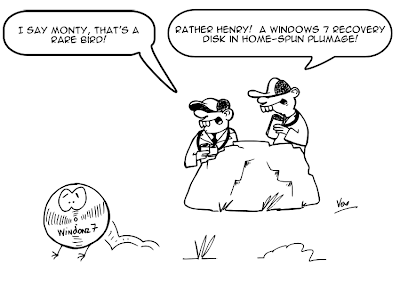 Many years ago, when Windows (and the Internet) were young, a browser software battle was fought, and Internet Explorer was the winner - not because it was the best, but because it was bundled with Windows, and because Windows had the biggest market share of computer operating systems. The problem however, is that Microsoft, in their infinite wisdom, choose to tie in the browser with the operating system, to the point where it had a dangerously high level of access to your computer - a situation that still exists. If you want safer browsing, one of the best ways is to change your browser to another, and for that, I recommend Mozilla Firefox. Not only is it quick, it is (by definition) safer (it's not tied to the operating system), and there are add-ons that actually make it even safer - it's NoScript add on for example, lets you control which scripts are allowed to run on your browser (stopping unallowed scripts is one of the best preventative measures for safe browsing I have ever seen). Antivirus is not an option anymore - it's a requirement for Windows, to the point where Windows itself will let you know if you have no antivirus present (look out for a red circle with a cross in your system tray - dead give away). You don't have to spend a fortune though - most new computers come with Norton or McAfee pre-installed, which does cost, but you can uninstall these and use a free antivirus solution, such as AVG or Avast. Most browsers these days have default settings that are quite good - again, look into the documentation for your browser for help if you think you may be at risk. This is rule of thumb #2, and it's a doozy. In short, as a user, you can go anywhere you want, install anything you want - but should you? That new file-sharing bit torrent client looks great... but do I really need it? What if it contains a virus? Ooh, Dave in accounts says that new site - "latinosheepsh*ggers.com" is fab - but what if it's a malicious website (come to think of it, what is Dave thinking about)... You get the idea. In the war against the Internet sharks, common sense is your greatest weapon. The Internet is huge - take my word for it, it's like the Ocean. Finding what you're looking for is like swimming in the sea looking for a shipwreck of a pirate vessel loaded with gold dubloons - without maps or directions, you'd be lost, poor and wet. Search engines like Google then, are our friends, because they provide the maps for us to navigate the Internet ocean. Most of the time (as far as we are concerned), the sea is safe, and shark free. 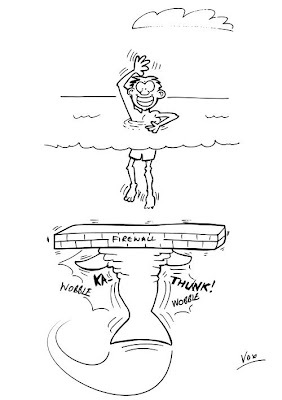 Recovery Disks - DO IT! DO IT NOW!!! When you're over 40, you develop a sense of maturity. You've raised your children wisely and well (Stephanie is currently working towards her exams, whilst trying to hide the fact that she's six months pregnant: Tristan is doing well with his plastering diploma he's working towards at Borstal, and young Brendan - well, we're not sure but, well, you know...). You've worked solidly towards building a lovely home (despite that wet patch in the ceiling), and life seems good. You know that nothing phases you, because you're a mature, sensible adult. "Hey, no problem - just use the Recovery Disks." At this point, cats have been known to jump through closed windows, rather than face the tirade of abuse and possible life-threatening hurled missiles that follow that phrase - because you didn't create them, did you? Do yourself the ultimate favour - create the recovery disks, because if your hard drive does fail, you may have to pay (yes, that's "PAY") to get a set from your manufacturer. There's no more bitter pill to swallow than that which costs you money - twice. "My computer runs so slowly..."
"I'm running out of memory!" "Stop pushing my buttons, I can only do one thing at a time!" "Your email is in the recycle bin!" Free memory is the single, most important thing you require, which is why it's usually the first thing that's upgraded. Computers need memory space to do anything - think of memory as paper sheets that you write on. Every time that you need to make a note, you get a fresh piece of paper, and you keep using fresh sheets because it's easier. That's great, but what happens when you run out of sheets - you've got nothing more to write on. "Oh dear, I can't write that note to dear Aunt Jessie..."
In short then, paging too much is not a good thing. Not only is it slow, but the computer is wasting it's time - which is where processor cycles come in. 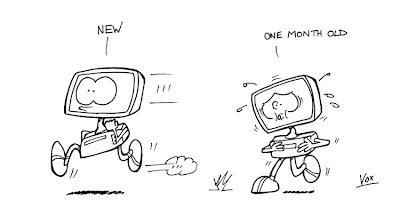 A processor cycle is simply a unit of time that computer can use to do something constructive. New, modern computers have CPU's (Central Processor Units) that can perform an incredible number of operations (or cycles) every second, but those precious cycles are easily lost through wastage, so instead of doing something useful, they could be being used to display a screen saver, or play a tune, or download crap from sharing sites. It's important then that if you want your computer to run efficiently, you should always make sure that you are only running what you have to - the infamous rule of thumb #1. We've mentioned fragmented disk space - this is relatively low on on the list, but it still applies in some cases. Remember our paper filing cabinet analogy? Well, when you were filing your paper sheets, you didn't care where you put them. They are all over the place, and whenever you want to find that note to Aunt Jessie, you have to search through several filing cabinets to find the sheets you need - that's fragmentation, and it happens to your hard disk. The older / more abused your computer gets, the more fragmented (and slower) your hard disk becomes. At this point, defragging your hard disk (essentially resorting the disk space) becomes a viable option, but DON'T SWITCH OFF WHILST YOU'RE DOING IT!!!! 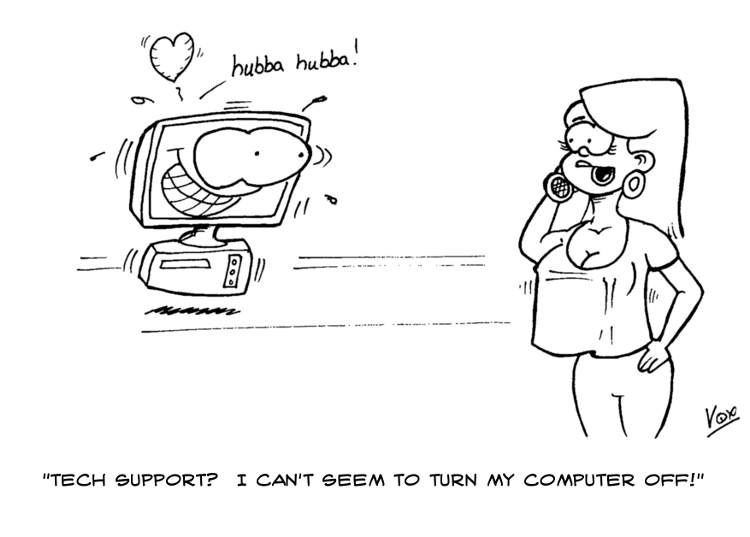 Fast access to hardware basically means making sure your computer can talk to it's peripherals (like hard disks or DVD / optical drives) quickly, and is the last thing that *could* slow a computer down. It could be that you have the wrong driver for the peripheral, or that something else is hammering it whilst you're trying to use it. With all this is mind, let's look at a couple of vict.. er, case studies. Mr. X came to me, complaining that his XP machine was slow - on examination, it turned out that his task tray (that's the little area on the bottom right of the windows desktop) had so many icons that it covered the entire taskbar! It seems Mr. X loved his gadgets, and had been trawling around the freeware sites looking for interesting ones, and then installing them - the trouble is that each one of these icons is a program that requires memory and processor cycles, so un-installing these programs made the machine responsive again. 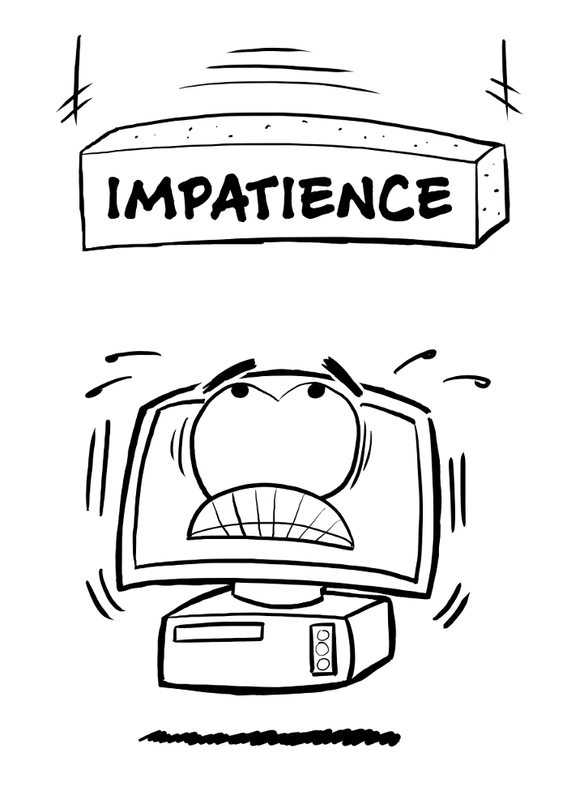 Mrs. Y had a new laptop (less than 3 months old) that was so slow, it took 25 minutes to load! In this case, windows explorer had somehow been nobbled (possibly by a trojan, or a rogue game) to the point where the hard disk light was constantly on - a sure sign of excessive hard disk activity. In this case, the only thing to do was to recover the machine to a factory fresh state by using the recovery disks. 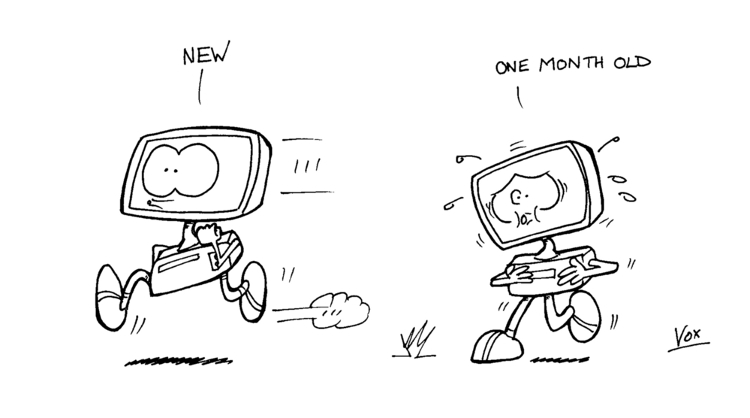 ...oh God, it's rebooting again... .. and again... ...AND AGAIN! 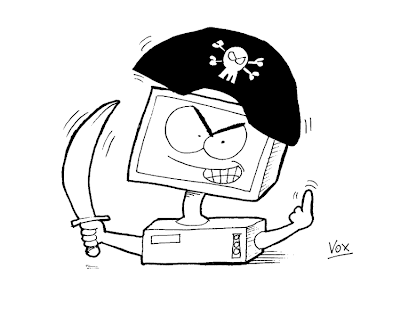 ARRRGGHH! 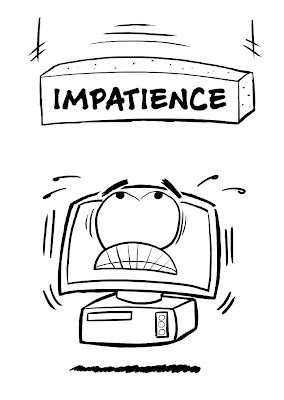 Welcome to the greatest computer killer of them all - Impatience. Computers are supposed to be lightning fast - after all, everything in them runs at the speed of electricity - but unfortunately, we will insist on actually using them. We install countless little gadgets, gizmos, and thingummies that all take time to start up when your computer boots, and to make matters worse, we then try and do something positive, like web browsing. The poor computer tries to do what you want, but it's now approaching the point where too many things are asking for resources. So it stalls you. It starts queueing the requests (if you're British, you should be used to queueing for God's sake), dealing with them as best it can. Systems requests, like updates to the Operating System or Anti Virus usually get first choice, at which point, your computer slows down to a crawl - it is of course, at this point, that we take the loaded gun of impatience, and shoot ourselves in the foot with it by hitting the "reset" button - effectively telling the computer to stop ANYTHING it's doing (including writing to your hard drive), and start again. It's no surprise then, to see your computer getting it's knickers in a twist as it tries to go through it all over again. If you can say "yes" to any of these, there's a 95% chance that your computer is NOT "locked up". If in doubt, wait 20 minutes - the chances are that any important tasks should have finished by then, and you'll be OK to reboot. "Have you turned it off and on again?" "Hey I've got a new computer - now what?" Let's be honest with ourselves. If you're over 40, you're a technophobe. You may not realize it yet, but admission of this simple fact is going to save you pain and suffering in the long run. TV remotes confuse us, to the point where when the battery runs low, we try and press the buttons harder, just to force that last erg of energy in the device into use by shear force of will. Microwaves mystify us, phones perplex us, and children's toys fascinate us - we're hopeless, and we've just gone and bought ourselves a piece of technology that we're not even sure we want (we only bought it because Dave in accounts has one, and he said it was the best thing since sliced bread...). Laptop - This computer has a screen and keyboard, connected by a hinge, clam shell style. 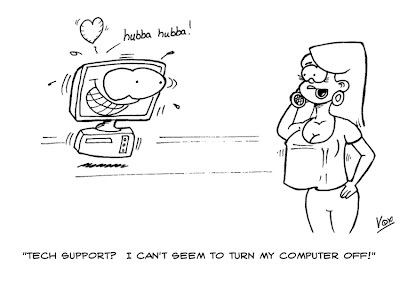 It usually has most of the features of a desktop (DVD drive, card ports, USB ports) but is usually not as powerful. Notebook/ Net book - This computer looks like a very small laptop. It (usually) has no DVD drive, and is less powerful than the laptop. Net books are smaller than notebooks. Operating Systems - to use a computer for anything, we need a way of controlling it, and this is where the Operating System (or O/S) comes in. The Operating System controls the hardware, so getting the right Operating System for the level of hardware in your computer is vital - too powerful, and your computer will slow to a crawl, too weak, and you won't be able to use the computer for anything. 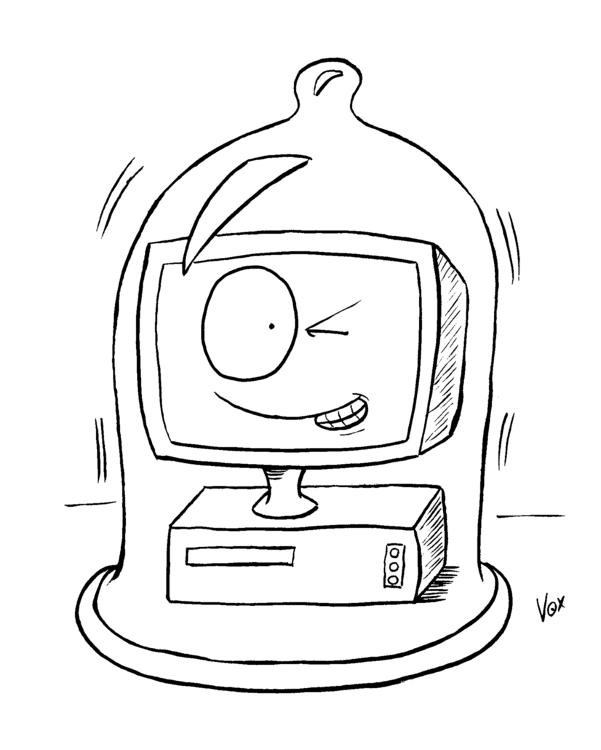 Desktops tend to use "Premium" editions of Operating Systems (i.e. you pay more money for functionality that was included in the last release for free) where net books use "Home" editions (all the bits that you may actually find useful have been nobbled). Whatever you have it will probably be too powerful for your machine, as Computer companies tend to ship whatever flavour of O/S that is in season - not necessarily the one that runs the quickest/ does the most. As I come from a PC background, let's look at what's available for the PC in terms of O/S. 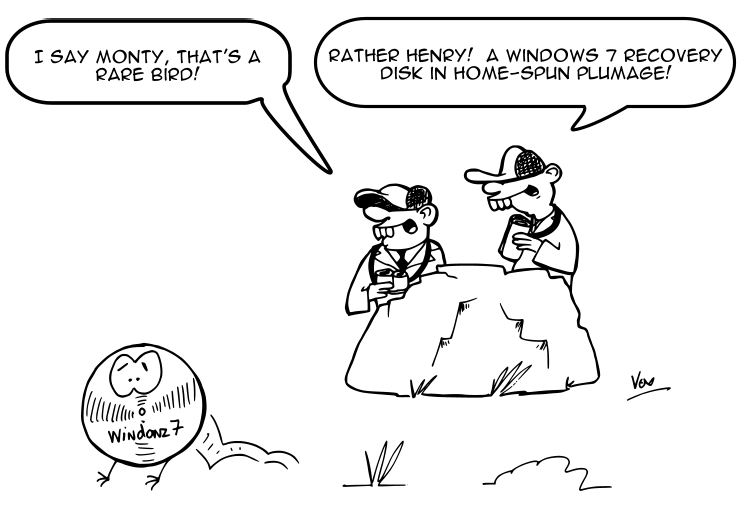 Most people with a PC run a flavour of Microsoft Windows, and you are probably one of them. Currently, the flavour of the month is Windows 7, but your PC could also have one of it's predecessors, namely Windows Vista or Windows XP. All of these do the same job, but with differing levels of gimmickry. Desktops/laptops can run any of these, but net books/notebooks should be running Windows 7 or XP (they use less resources than Vista, and don't crash half as much). If you're not running Windows, you may be running a Linux or Apple based O/S - congratulations, as you may not have as many problems in the long run as your windows brethren. Net book / Notebook - Web browsing, word processing, social networking. "DON'T RUN MORE THAN YOU HAVE TOO"
Day by day, I've seen healthy, grown men cry in despair as these pieces of electronic mayhem wreck their otherwise peaceful existence with blue screens, flashing lights and seemingly unending problems which would test the patience of the holiest of clergy. .. but remember to take some travel sickness pills.